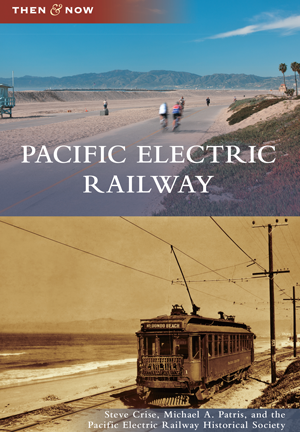 The Pacific Electric Railway originally provided reliable transportation across more than 1,000 miles of track. Postwar society's affair with the automobile led to the loss of an infrastructure that could have formed the basis for an enviable modern light-rail system, one that current society would be happy to utilize. Authors Steve Crise and Michael Patris look back at the railway and its landscape today. Both serve on the board of the Pacific Electric Railway Historical Society, from whose archives most of these images are taken. Authors Steve Crise and Michael Patris look back at the railway and its landscape today. Both serve on the board of the Pacific Electric Railway Historical Society, from whose archives most of these images are taken.